Lucy greatly enjoys sharing her knowledge of Feng Shui. Her annual talk on the upcoming year’s Feng Shui energy has been very popular. So much so that since 2014 it has been the opening act in the yearly event calendar of Expat Living Singapore. Lucy’s talks are often held at furniture and home décor shops where she can easily demonstrate the practical implementation of Feng Shui. Her informative and entertaining talks, coupled with her passion for Feng Shui, will make for a memorable event and the audience will be motivated to apply what they have learned immediately. Please contact us for more information on any of the talks you are interested in. We are also happy to customize our presentation to suit your specific purpose. Lucy conducts Feng Shui workshops for small groups where she explains the different Feng Shui formulas as well as the connection between the five elements (water, wood, fire, earth and metal). Participants will also learn how to determine their personal good and bad directions and how to apply these in their everyday life. 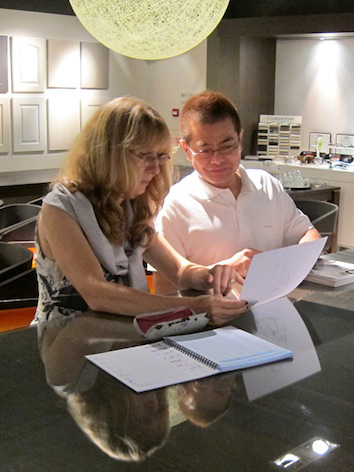 With Lucy’s help, participants are then able to analyze their own floor plan, identify problem areas (if any) and apply the basics of Feng Shui to create an auspicious home with positive energy. Upcoming events and workshops will be announced in our monthly newsletter. Please feel free to subscribe if you do not want to miss it.